Why yes, there is! And you can see one pictured above, that Allison crafted for me. (and pssst! She has another one just like it listed in her shop. #ChapletEnabler ;-)). The fact that the beads are Snowflake Lapis and Snow Quartz, with a snowflake centerpiece, just adds to the perfection, in my opinion. So how do you pray this chaplet? Make the Sign of the Cross on the Crucifix. On the three beads of the "drop," pray one Our Father, one Hail Mary, and one Glory Be. Remember, O most gracious Virgin Mary, that never was it known that anyone who fled to your protection, implored your help, or sought your intercession was left unaided. Inspired by this confidence, I fly unto thee, O Virgin of virgins, my mother. To you I come, before you I stand, sinful and sorrowful. O Mother of the Word Incarnate, despise not my petitions, but in your mercy, hear and answer them. Amen. On the white beads, pray five Hail Marys. My soul proclaims the greatness of the Lord, and my spirit rejoices in God my Savior, for he has looked with favor on His lowly servant. From this day, all generations shall call me blessed. The Almighty has done great things for me, and Holy is his name. He has mercy on those who fear him in every generation. He has shown the strength of his arm, he has scattered the proud in their conceit. He has cast down the mighty from their thrones, and has lifted up the lowly. Make the Sign of the Cross, and you're done! I've used my chaplet several times since I received it, and absolutely love it. The Memorare is one of my favorite prayers, there is something about the lilting Marian phrases that really draw me in. 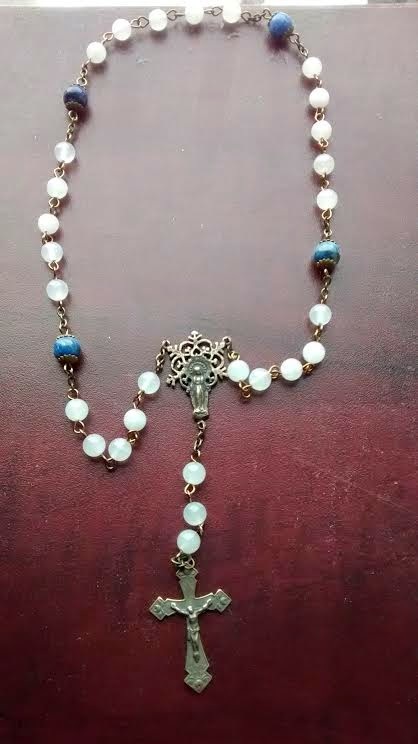 The beads on my particular chaplet are a bit heavier than most of my rosaries, and very smooth, and they feel so solid and comforting moving through my fingers. I just love it. I prayed the Chaplet for the first time today. My mother bought me the "Our Lady of Snows" rosary from EWTN last year for my birthday. Our Lady of Snows feast day falls on my birthday of August 5.